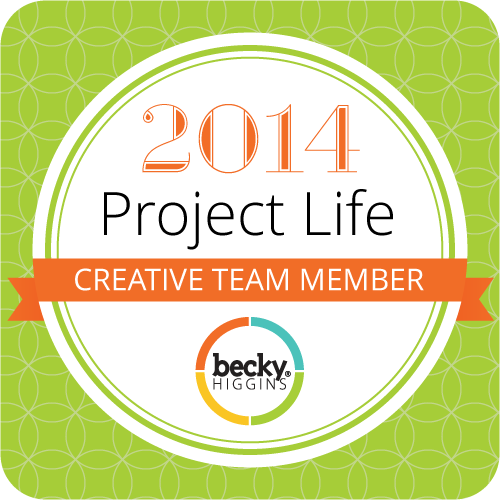 Recipe – It Works For Bobbi! Do you find yourself looking for delicious meal alternatives for meatless Monday that will satisfy the entire family? This is our family’s go-to dish – manicotti shells stuffed with 3 cheeses and sauteed peppers and onions and baked to perfection. The best part about this recipe is how versatile it is! You can make all kinds of substitutions to use up what you’ve got on hand. I’m sharing the recipe and tutorial over on HowDoesShe.com, so pop by and check it out. I promise you’re going to love it! One of the most popular items at the Stampede is the yummy corn dogs. To me, corn dogs are one of those things that you can have once or twice a year and be satisfied. I don’t need them all of the time, and I certainly don’t want to spend the $$$ to BUY them very often – especially at the stampede! I decided it was time for me to be bold and brave and make some homemade corn dogs for the kids for lunch. I was inspired by a local morning show which aired a segment on making homemade deep fried goodies. I don’t own a deep fryer, but it CAN be done with a pot and some canola oil. I found a great recipe on Hill Billy House WifeI would love to share with you – my masses of loyal readers 😉 It’s SUPER easy and it tastes delish! In a large bowl combine the milk, eggs, oil, sugar and salt. Mix it very well. Sprinkle in the baking powder, corn meal and flour. Stir it all up to make a slightly thick batter. Take your hot dogs and dry them off on paper towels. Dust the hot dogs with flour, coating them completely. The cornmeal batter won’t stick to the hot dogs unless they are coated in flour. The batter just slides right off of the wieners naturally slick outsides. 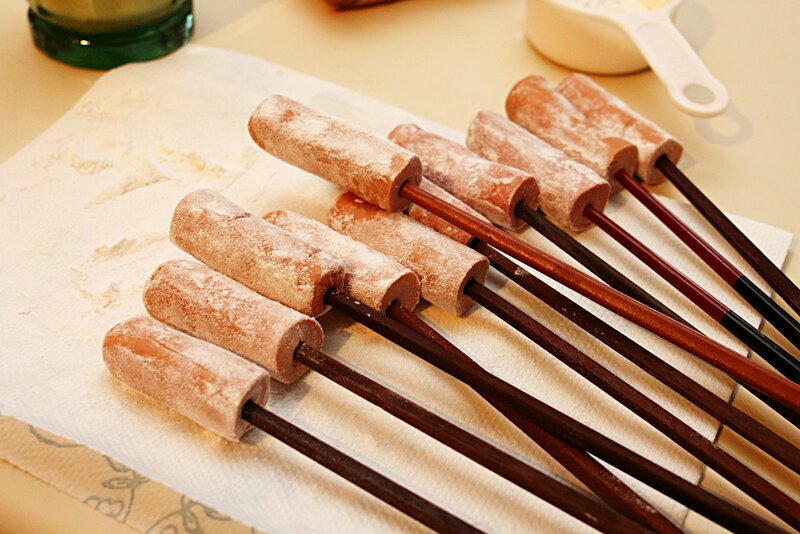 Shove popscicle sticks into the flour coated hot dogs. Set the hot dogs aside. While all of this is going on, it’s a good idea to get your hot fat to heating up. You want the temperature to be about 375° (or medium-high heat). Allow the fat to preheat so it is almost smoking by the time you are ready to add the corn dogs. Scoop some of your corn meal batter into a narrow jar or cup which is as tall as your hot dogs are long. 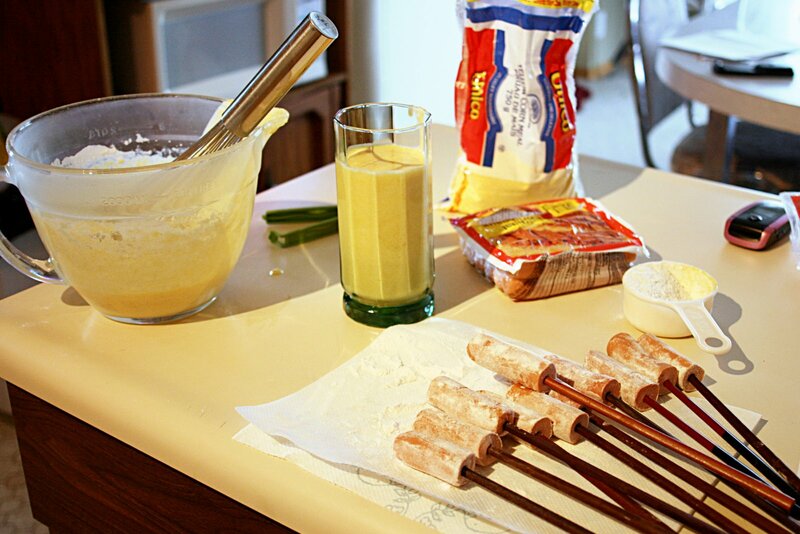 Dip your hot dog into the batter while you hold onto the stick. Swirl the hot dog to coat it evenly. Raise the wiener above the cup and let any excess batter drip off. Quickly place the battered dog into the hot fat. The fat will bubble up and cook the outside of the batter, making the corndogs the exact same shape as the ones you buy at the store. Only fry a few corn dogs at a time. If the corn dogs crowd each other they don’t fry very well. I only fry 2 or 3 at a time. Turn the corn dogs when the bottom side is well browned. 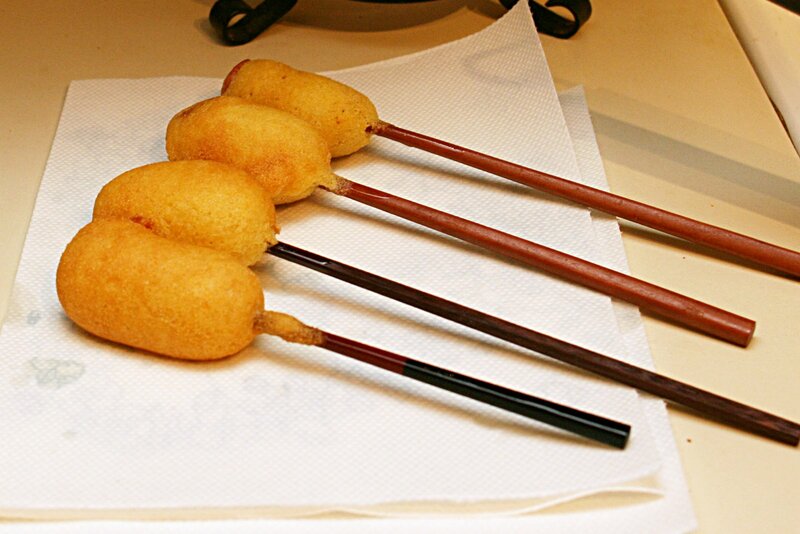 Use tongs to remove the cooked corn dogs from the fat. Allow them to drain on paper towels. Repeat the process, coating and frying a few at a time, until all of the corn dogs are cooked. 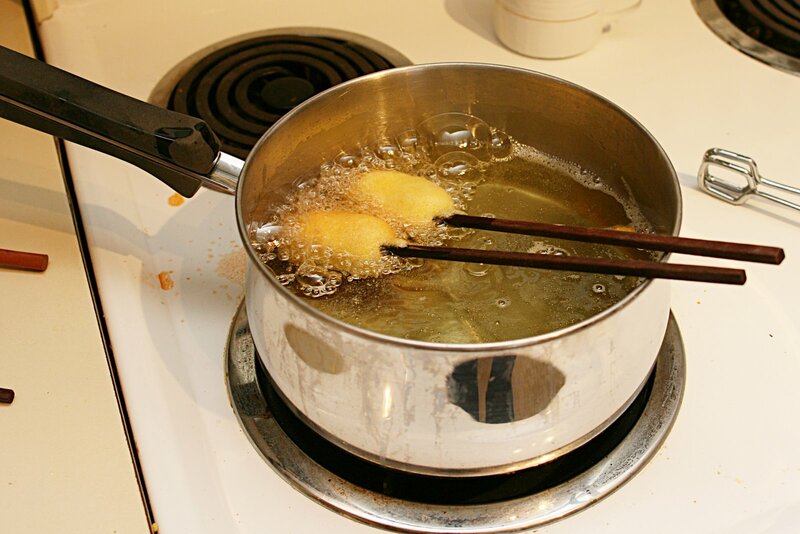 If you don’t want to waste any unused batter, it can be dropped by small spoonfuls into the hot fat, and fried until brown. Serve these along side the corn dogs. The kids loved them – and I’m ashamed to admit that I did too! I had plans to eat healthy this week to prepare for my week at the beach – but I’ll start eating healthy tomorrow 😉 Go on and try it! I know you want to! Warning: You might have a hootin’ and hollerin’ good time right in your own home! We sure did!